The Kelly Miller Big Top Circus will be in Kokomo on Friday, May 6, 2011. The excitement starts early as elephants pull the big top into the air in Future Park in Downtown Kokomo. There is no charge to watch the enormous tent (with seating capacity of 1,500 people) being set up for the big show. 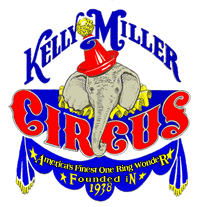 The Kelly Miller Circus has been providing family entertainment since 1938. The show will feature clowns, tigers, elephants, juggling, and many other special and fun acts this year. Show times are 4:30 pm and 7:30 pm. Future Park is located next to Kokomo Memorial Gym on Apperson Way in Downtown Kokomo. Advance tickets are $10 adults & $6 for children under 12. On circus day, tickets will be $15 adults & $7 for children under 12 at the door. Advance tickets are available at Kokomo Parks & Recreation Department, Martino’s Italian Villa, The Pointy Pencil, Erik’s Chevrolet, and Mac’s Market. For more information, call the Kokomo Parks & Recreation Department at 765-456-7275 or visit www.KellyMillerCircus.com. Come one, come all to the circus in Downtown Kokomo!